(Nanowerk News) The National Science Foundation has awarded $466,954 to University of Arkansas physicists to study the ultra-thin material black phosphorous for its potential use in fiber-optic communication. Black phosphorous, which can be thinned down to a single layer of atoms, is an ultra-thin semiconductor has the potential to power optoelectronic devices, which use both light and electricity. Some current optoelectronic devices are solar cells and light-emitting diodes, better known as LEDs. “Black phosphorous exhibits strong potential for applications from thin-film electronics to infrared optoelectronics,” said Hugh Churchill, an assistant professor of physics and the principal investigator on the project. 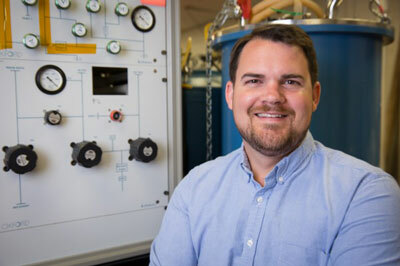 Hugh Churchill directs the Quantum Device Laboratory at the University of Arkansas. The research will shed light on the long-term potential for a new kind of optoelectronic device that would feature an optical switch – the kind needed for fiber-optic communication – in which electricity could control light. Such a switch may be smaller, faster and more energy-efficient than current technologies. Churchill and Salvador Barraza-Lopez, an assistant professor of physics serving as co-principal investigator on the project, will model and observe the behavior of excitons in black phosphorus. When a semiconductor absorbs light, an electron moves up in energy and leaves behind a hole. This electron and hole can bind together, forming an exciton. In traditional semiconducting materials such as silicon, excitons are formed at extremely low temperatures, just a few degrees above absolute zero, or they disappear almost instantly. They form at much higher temperatures in black phosphorous, Churchill said.